On my bookshelf: "Julius Shulman: Palm Springs"
Mr Tonic (aka The Architect) has informed me via email that he just hurled his credit card at this book - "Julius Shulman: Palm Springs". Me? Excited. maybe i should hurl my credit card at a plane ticket! Julius Shulman was a great guy, and I am glad that I knew him. He contributed so much to promoting Palm Springs and making its architecture as iconic as it is now. Glad to see that he's appreciated around the world. We miss him! What a great hubby! I am obsessed with Palm Springs and the mid-century modern thing. Can't wait to see what you do with your new place, it looks fantastic. I would love to get this book, will you share it with us when it arrives?? Oooo please let us know what it's like! It looks fab from the cover. Palm Springs always gets me excited. Hope you've had a good weekend! heading to Palm Springs in 2 weeks ... LOVE it. Go at least once a year. Doing a tour of homes this time - excited. Don't think we get to go inside, but even just outside is going to be wonderful. I will post about it on my blog when I come home. BIG fan of mid-century architecture :) Jealous of the book, might have to put my name in for that too ... Enjoy it! 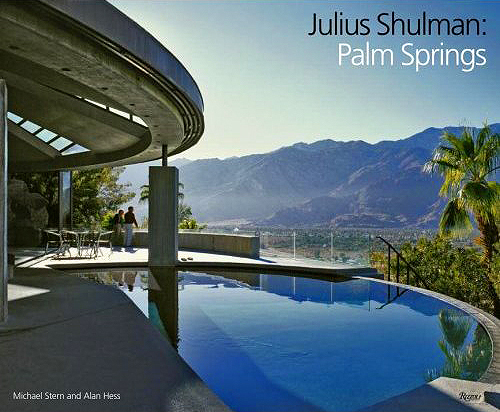 Its a fantastic book, highlighting some of Palm Springs' best architecture. We're a mecca for the mid-century era! And of course we gladly welcome our friends from down under who would love to see these buildings in person!